I don't blog about products very often, but Urban Velo had a blurb about this Pulse urban concept bike by Teague, and I thought it was pretty cool. The original article is on core77. 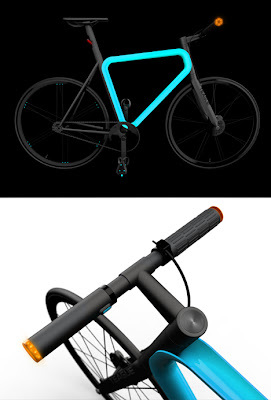 I think the frame design is a great idea, and the fact that the frame and turn signals light up is awesome. I also like the look of the bike quite a bit. The only thing I would wish for is more of a light in the front and back for night time. I wonder what the power source is for the lights and how easily one could get their feet in the pedal cages. If the price was right, I think this would be a really fun bike for city commuting. That could double as a work of art. Very cool. Very nice bike. If I ever buy a second bike, it would be a commuter ... something casual to ride around town and run errands. With this one, it looks like you can really commute in style. Thanks for pointing it out! In memory of Susan Nelson. WIN!